Definition at line 39 of file LlvmSemantics2.h. Instantiates a new RiscOperators object and configures it to use semantic values and states that are defaults for LlvmSemantics. Definition at line 71 of file LlvmSemantics2.h. References Rose::BinaryAnalysis::InstructionSemantics2::BaseSemantics::RegisterStateGeneric::instance(), Rose::BinaryAnalysis::InstructionSemantics2::SymbolicSemantics::SValue::instance(), Rose::BinaryAnalysis::InstructionSemantics2::SymbolicSemantics::MemoryListState::instance(), Rose::BinaryAnalysis::InstructionSemantics2::BaseSemantics::State::instance(), and Rose::BinaryAnalysis::InstructionSemantics2::BaseSemantics::RiscOperators::solver(). Definition at line 80 of file LlvmSemantics2.h. Definition at line 85 of file LlvmSemantics2.h. Definition at line 92 of file LlvmSemantics2.h. Definition at line 97 of file LlvmSemantics2.h. Run-time promotion of a base RiscOperators pointer to Llvm operators. 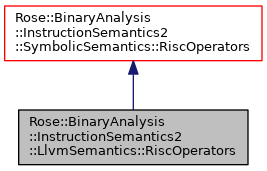 This is a checked-converstion–it will fail if x does not point to a LlvmSemantics::RiscOperators object. Definition at line 107 of file LlvmSemantics2.h. Different versions of LLVM have different assembly syntaxes which are not backward compatible, and this property which dialect is emitted. This property is set to a*x^2 + b*x + c where a, b, and c are the three-part LLVM version number "a.b.c" and x is 1000. The special value zero is reserved to mean that the version number is unknown. Definition at line 123 of file LlvmSemantics2.h. Definition at line 124 of file LlvmSemantics2.h. Increase indentation by nlevels levels. Indentation is decreased if nlevels is negative. Returns the new indentation level. It is permissible for the indentation to become negative, but prefix() always returns a non-negative amount of space. Definition at line 142 of file LlvmSemantics2.h. Return the list of registers that needs to be emitted to LLVM. Regardless of what registers are written (e.g., AX), return a list of registers that we're keeping track of in global variables (e.g., EAX). Return the list of important registers that are stored. This is a subset of the value returned by get_important_registers(). Return the list of important registers that have been modified since the last call to make_current(). Return the descriptor for the instruction pointer register. Return the value of the instruction pointer. Return the list of memory writes that have occured since the last call to make_current(). Each item in the list is an OP_WRITE symbolic expression, and the list is in the order the write occurred (oldest to most recent). The memory states are each unique and not used for anything in particular. Definition at line 190 of file LlvmSemantics2.h. Mark the current state as having been emitted. Returns the LLVM variable name including its sigil. If the variable doesn't exist yet then it's added to the list of known variables. Returns the LLVM name for a variable, including the sigil. If the specified ROSE variable has no corresponding LLVM definition, then the empty string is returned. Output LLVM global register declarations for the specified registers. Output LLVM global register definitions for the specified registers. Output LLVM global variable reads that are needed to define the specified registers and pending memory writes. The dictionary is used to convert register names (that appear in symbolic variable comments, like "eax_0") to register descriptors. If a register reference (like "eax_0") corresponds to a register that we're not interested in, then don't bother emitting a temporary variable for the register. Output an LLVM branch instruction. The latest_insn is the most recent instruction that was transcoded, usually the last instruction of a basic block. Output LLVM to bring the LLVM state up to date with respect to the ROSE state. Obtain the LLVM type name for an integer. Convert a ROSE variable or integer to an LLVM term. A term must be a constant or a variable reference (rvalue). Convert a ROSE variable to an LLVM lvalue. The variable must not have been used as an lvalue previously since LLVM uses single static assignment (SSA) format. Obtain the name for an LLVM label, excluding the "%" sigil. Obtain a label for a virtual address. Obtain a label for a function. Emit LLVM statements for an expression. and returns the symbolic variable "v6". Emit an assignment and add a rewrite rule. The left hand side is a new LLVM temporary variable (which is returned). If rhs is an LLVM unamed local variable then rhs is returned. Otherwise, a rewrite rule is added so that future appearances of the right hand side will be replaced by the left hand side in calls to emit_expression(). Emit an operation as LLVM instructions. These "emit" methods take operands that are symbolic expressions and output LLVM instructions that implement the expression. The return value is either an LLVM term (variable or integer) or an expression. Expressions are only returned in cases where the operation is a no-op, such as for the symbolic expression "(add (negate v3))" where the "add" is a no-op that simply returns its only argument. Because these "emit" methods might return an expression, it is customary to call emit_expression() on their return value.